16 cm wide (6 inches). 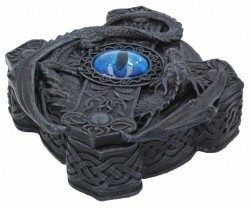 Very detailed box with dragon around large ice dragon eye within the centre of a Celtic cross. Great for keeping keys, dice, money, jewellery etc.